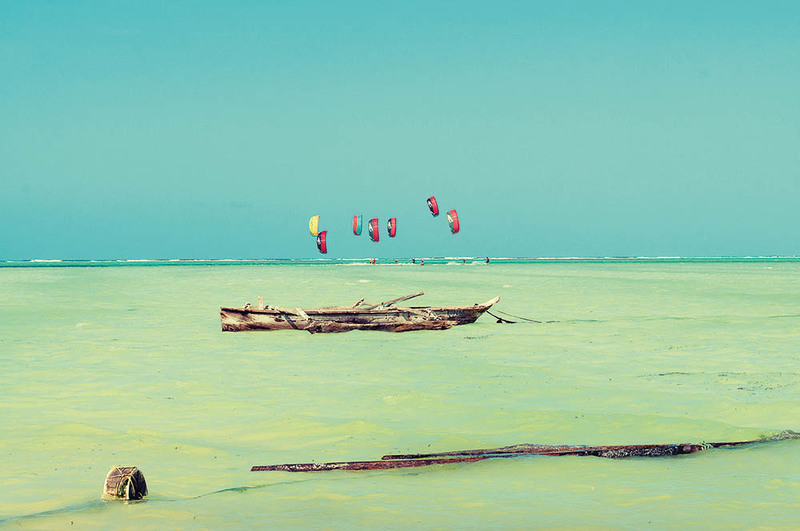 Great value holidaying, reliable winds flat-water lagoons, endless waves and 25km downwinders right at your doorstep. That’s why Zanzibar makes headlines around the world. Since 2012, Moon Tours has been expanding the quiver of off-the-grid adventure holidays to Fiji’s remote far north, Papua New Guinea, Mauritius, Mexico, Mozambique and Tanzania. 2016 is set to top it all with new expeditions on the menu but there is one place they can’t let go of, and for good reason. This is Zanzibar Island, Tanzania, East Africa. This year, the Zanzibar trip is set to be the best one yet. After visiting the small island off the coast of Tanzania a number of times the guys at Moon Tours have all the boxes ticked, they know all the right people and how to get you around this bustling trading island. 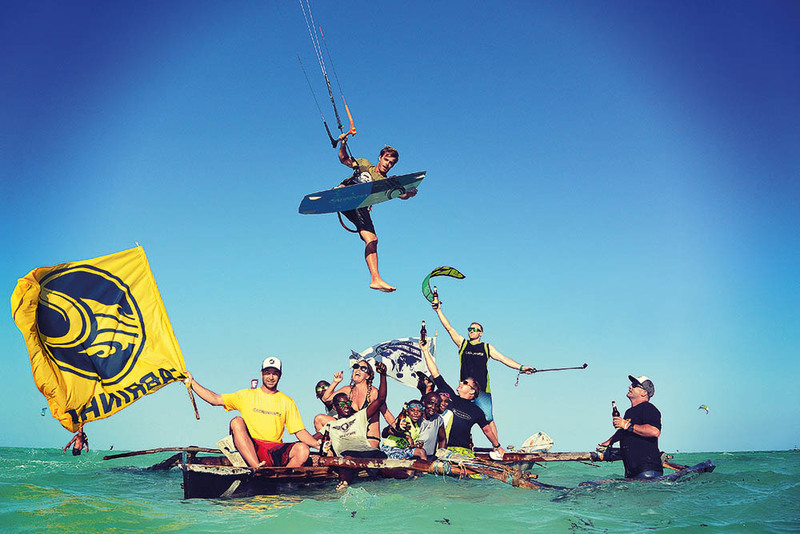 With over 20 years of African experience, the team wants to offer Australian kitesurfers unique off-the-beaten-track expeditions jam-packed with epic kiting, surfing, culture, history and adventure. 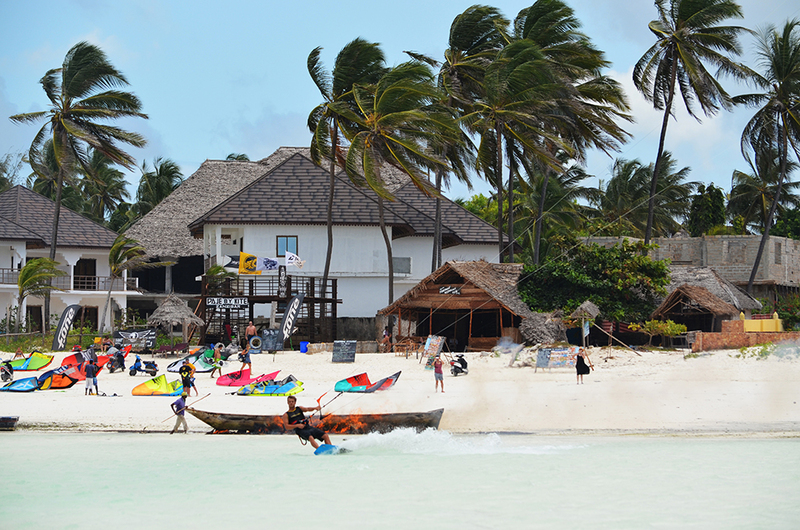 The all-new kite and surf dedicated eco lodge is owned and run by Kenyan-born Jan. Jan is by far the most experienced local kiter and surfer in East Africa and knows all the secret spots around Zanzibar. Zanzibar has a great vibe, incredible history and culture. There are multiple eateries and bars right on the kite beach. This place is super kite friendly. If you want to tick an African safari off your bucket list why not take advantage of Tanzania’s incredible wildlife? It’s home to some of the best parks in Africa and also to The Great Migration, where over 1 million wildebeest and zebra move with the seasons, dragging an abundance of wildlife with them. Generally speaking, from Australia it’s best to fly through Johannesburg, South Africa and on to Tanzania and Zanzibar. You can also find flights via Dubai and Oman or even Mauritius. We always fly with South African Airways from Australia. In economy you get 46kg checked luggage as standard plus the usual carry-on 7kg. SAA are code share partners with Precision Airways, which means if you book on one ticket the 46kg check-in will carry through to Zanzibar. We usually get from Melbourne to Zanzibar return for about two grand. Getting around Zanzibar is pretty easy. On the kite beach, Paje, you won’t need to travel far, so walking or grabbing yourself a scooter from one of the local beach boys is the go. Grabbing a cab or mini van for tours around the island is safe and not very expensive. Just make sure you agree on a price before setting off. 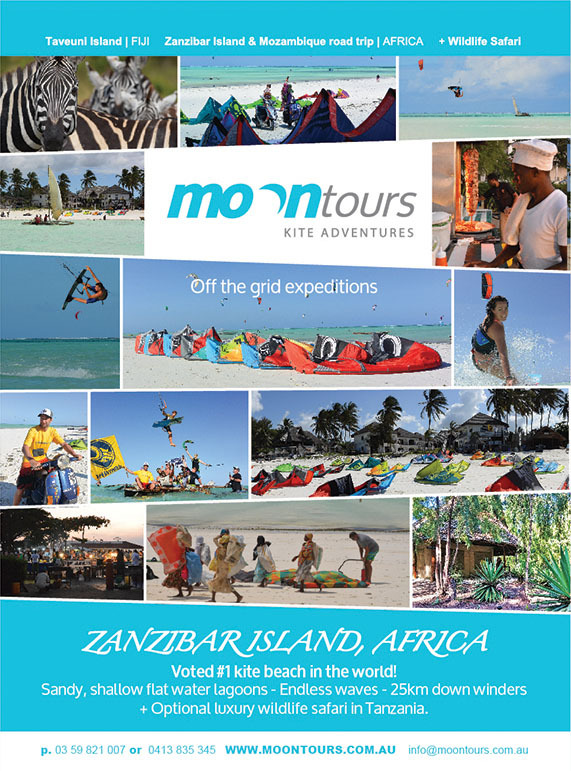 Moon Tours makes the annual pilgrimage to Zanzibar in the Australian winter for obvious reasons, generally in June, July or August. For 2016 the team will be there in late June into early July offering only one trip for the season. island tours, downwinders, kite coaching and more. Unguja, or Zanzibar as it is commonly known, has a rich history and culture as a trading port and offers many on and off the water experiences. Zanzibar is approximately 85km long and 39km wide and covers 2461 square kilometres. There’s so much to do. Head to Jozani Forest National Park to see one of the rarest primates on earth endemic to the island, the Red Colobus monkey. Visit Old Stone Town, the night markets, try Dhow boat sailing, or take a spice farm tour. Eat at the famous Rock Restaurant, visit old Prison Island or head north to the beautiful beaches of Nungwi and the Mnarani Turtle sanctuary. With shifting tides on a huge 30km stretch of sandy beach and a barrier reef, this place has super fun waves that keep the inside sandy beach to kickers at high tide, flat-water lagoons on low and 25km downwinders on a mid-tide. You won’t have to catch boats, buses, ride bikes or hitch rides, just step on to the beach and go. Grab a couple of scooters to cruise the beach or do some mini downwinders. Grab a beer for the way and enjoy paradise. There are two names for the infamous trade winds and, to be honest, it never occurred to me why they call it ‘trade winds’ until we learnt that Zanzibar has literally grown from these reliable ‘trades’. Pushing boats up and down the east coast of Africa for hundreds of years and still to this day as the local Dhow boats set sail with the daily winds. From June to October the best of the ‘Kusi’ wind blows from the south east and the ‘Kaskasi’ wind from the north east December to February. The average wind speed isn’t super strong, around 16 knots and increasing in the late afternoon.